we went to San Francisco primarily because Z is a software engineer. That is to say, he writes code that make internet web sites, and more recently, apps, work. He has quite a talent and is filled with brain waves quite different from my own. A result of this is that he sometimes works on a big project that is a WordPress multi-site of roughly 2500 (?) web pages for Campus Crusade called GCX (are you tracking with me…knowing I could be slightly wrong and/or off?) 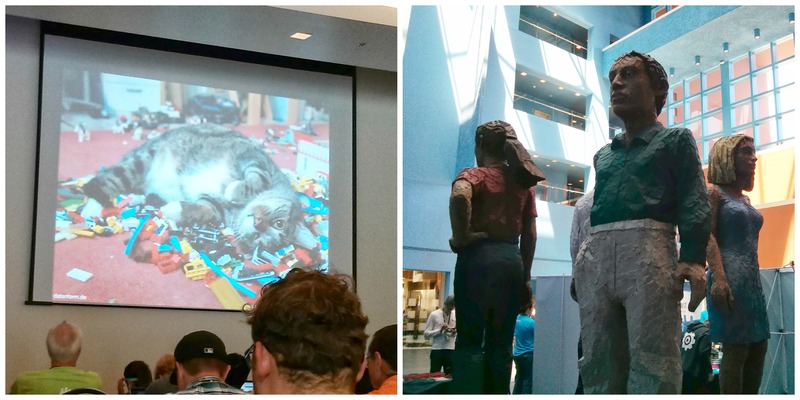 GCX runs on WordPress so he went to WordCamp San Francisco. All that said, I tagged along because this blog is also run on WordPress. I am not the genius that he is but I can tag along and hold my own blog wise and never ever have written more than one word at a time of code and that only for making margins bigger or something like that. WordCamp has two tracks though, the smart young people upstairs (ie developers) and the rest of us downstairs (users.) Does this start to feel like Tron? No wonder he likes that movie. Anyhow, I went to the conference and went to the user track (except one developer one which was both over my head and super dull) and I learned a few things along the way. Some about blogging, some about a few big marketing ideas in general. I really related to some of the speakers for my own day to day job. But, we used the opportunity for being there to see the city and eat our way around. Here are some things I really enjoyed about the conference. 1. Pretty much every presenter at the conference referenced He Who Shall Not Be Named. (That would be Voldemort. I’m not scared.) And, a photo I’ll add to this blog reminds me of the statues in the Ministry of Magic was in the general meeting area at the conference. I cannot explain this at all. During the state of the word address by the younger than I founder of WordPress who has worked to revolutionize the interweb there was a comment made which was Usage is oxygen for ideas. I totally resonate with this. If you don’t use something you can’t know how to make it better, or more fun, or actually useful or whatever. Be a user. The other things I learned were these. They reference web sites of course, but I say, for marketing and ‘sales’ in general these are the markers of good content. Why? Be clear about the why of the existence of the website. What is a successful visitor going to get, see, do from your space. who are they, what do they like, do, how to help them. Make the space work for them. As opposed to just text, info graph, white paper, audio, video, webinars, etc. Where? Are people going to find the website. of course don’t have a url that MAKES NO SENSE or people can’t remember. How often do you update content. An editorial calendar when it comes to blogs but also holds true for stores, museums, etc. Clearly you can’t update some things that are spendy as often as others but keep it on the radar. How? Will you know if site is meeting audience needs. Analytics. Benchmarks, likes, reservations, etc. how to know if business is coming , coupons, stc. Unless your space is ‘just for fun’ then you have to have a way to decide if it is working. All this makes me want to be better at every aspect of what I do. Working, blogging, whatever. I love strategy. There was also food at this thing, just to be clear. Lunch everyday where you could mingle and ‘horrors’ …network. Some of our lunchmates were interesting and chatty, some I decided should have saved the airfare and some just sat there in introverted terror. The best thing they served were these glazed lemon poppyseed cookies. I pretty much want one right now. doesn’t that sound dirty for some reason? I don’t really have anything to say about this. 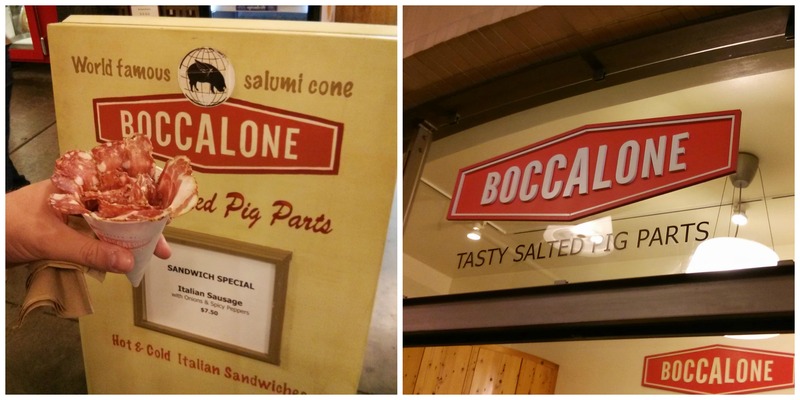 Boccalone – tasty salted pig parts. Chef Chris Cosentino who has a love of all things offal. It’s his little stand in the Ferry Building which is a place I could not get enough of (the Ferry Building, not necessarily the meat cone). Z had a love for the meat cone which is a trio of salted cured meats in a handy walkaway cone and even bought the tee shirt. That is all. well, I can say that Hubert Keller wasn’t on my radar until he made macaroni & cheese in a dorm room on Top Chef Masters and used the shower to rinse the noodles. I don’t really rinse noodles but I guess that’s how he rolls and he won so who am I to judge. Either way, we were able to walk over to one of his restaurants, Burger Bar, while we were in San Francisco and have a quantifiable gourmet burger. Before I get into that let me tell you about the view. Six stories above Union Square we sat against the huge glass windows looking out over the public space. It was enough to give a girl a little vertigo. After we ordered we sat and watched the people meet and greet each other in the park, sitting on the steps, sitting at the coffee terraces, coming and going. The view was really amazing and made the few extra dollars tacked on to the burger. I ordered the Black Jack Burger which had monterey jack cheese and olive tapenade with Angus beef on a ciabatta roll. I wouldn’t have particularly expected it to be tasty as I couldn’t foresee how the mildness of the cheese could match the strength of the olive spread but it was really delicious with a smear of mayo on the roll and I devoured it! Z had a peppercorn burger which was crusted with crushed pepper and had a housemade Dijon mustard and creamy peppercorn sauce. 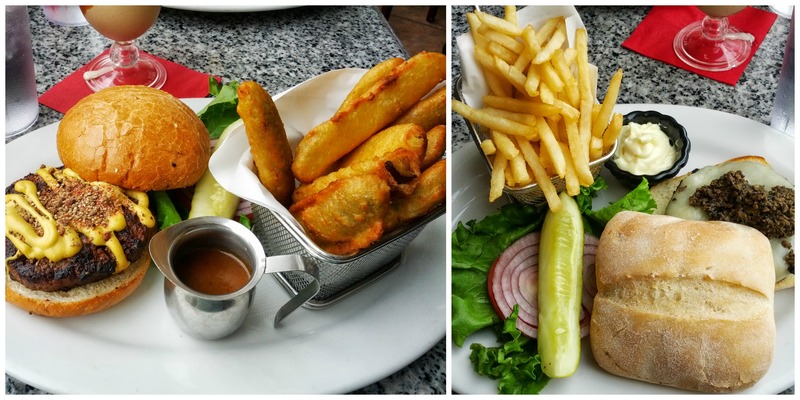 The real stand out though, were the deep fried jalapeno pickles that he upgraded his fries to. Great spears of spicy pickles deep fried in the lightest crunchy breading. Seriously, I nabbed way more than my ‘fair share.’ They were so delicious I was inspired to try this at home sometime this week and shamefully bought one bottle of beer at the grocery store. You know how stupid I felt buying one bottle of beer? Oh well, it’s all in the name of adventure! I can’t wait to try. We made our own spicy habanero pickles so watch for that! after so much enjoyment from eating at Dosa-we jumped in a cab and instead of heading for the hotel, we asked the driver to take us to Smitten. What we found? A crazy ice cream stand built in a container serving up made to order scoops of ice cream. The ice cream is made using a unique mixing bowl with a hook attachment and liquid nitrogren. They use locally sourced high quality ingredients. The result is smooth and mind blowingly natural and tasty ice creams. I pretty much never want ice cream-it just isn’t my thing at all. But I decided, sort of like falling in love, to throw caution to the wind and ordered a mint chip with Tcho chocolate flakes. The mint was actually kind of weird. It actually sort of tasted leafy, but not in a bad way. And honestly, I could have a fling with that Tcho chocolate sauce on top. Ridiculous. Z had Tcho chocolate with spicy caramel sauce. It was so smooth and filled with flavor. Plus the surroundings were way more hipster than we’ll ever be. It was like we dropped out of the city into a neighborhood of designers. Next door sat a gathering place biergarten serving out of containers and filled with families and friends toasting the end of the week. It was fenced in the most charming way. A thing to behold and remember, a reason to be smitten. this one has been long on my bucket list. Z actually ate there on his last trip to San Francisco and we were able to go this time too. We jumped in a cab and headed out from our hotel. Dosa was about 15 or 20 minutes up and down San Francisco’s famous hills until we pulled up at the restaurant. I doubt we looked local but as we walked in a guy asked us for directions. We walked in and were seated at a little table up in the balcony area right away. Sadly, our server didn’t know we were there and that caused a little confusion but they got it straightened out and we began to wind our way through the South Indian menu. A small bowl of papadums was delivered for us to munch on with our drinks. Papadums are sort of most typically a thin cracker that is made of lentil, chickpea or black gram flour and they have a savory flavor. Z ordered a smooth and refreshing mango lassi while I ordered a ‘spice route’ gin & tonic from their specialty cocktail menu that included a house-made tonic flavored with fig and cardamom. It had a beautiful saffron glow in the bottom of the glass and was rather dry and refreshing. The mango lassi is amazing with the tart cooling yogurt on your tongue after you consume fires of chutney. We decided to share small plates in order to taste the most flavors and I was so glad that we did. We started with crispy fish pakoras. The fish was sustainably caught, marinated in cumin, chile, ginger and garlic-then fried. It was served with a a hot chutney and a sweet onion chutney. Let me tell you something right now. The chutneys in South India’s cuisine are out of this world! Each one unique and amazing, full of flavor. You want to just keep dipping and eating them. They develop so much curiousity on your palate. Our next plate had two samosas, one ‘North’ and one ‘South’-one filled with vegetables and one with potatoes but the chutneys! Oh-one spicy with habaneros and one sweeter. The third small plate was full of idli with cilantro chutney. Idli are normally steamed cakes made of rice and black gram paste but these were more than that. Cut into slices and fried and then dusted with spices. I wanted to keep tasting them. We also had to have a dosa. A dosa is a huge crepe like pancake made of fermented lentils and stuffed. Ours was smeared with spicy basil, curry leaves, cashews, shallots, chile and ginger and filled with a mound of masala (spiced mashed potatoes). You eat it by breaking off a piece, dipping it in this delicious sambar (lentil dipping soup) and then into chutneys. Oh man. It was amazing. So much flavor. It was a really exciting meal. I am in love with this food and can’t wait to try it again and again! *a little side note if you are looking for a good read that I need to pull out of my bookcases. Monsoon Diary: A Memoir With Recipes by Shoba Narayan is a great detailed food memoir about life in Chennai India. I read it alongside the first Indian meal I ever cooked, and likely one of the first I ever ate, about 8 or 9 years ago. I would recommend it highly.